Intermittent left bundle branch block is an uncommon conduction disturbance with only few cases reported in the literature, mainly following myocardial ischemia or cardiac blunt trauma (1). Bundle branch block (BBB) may occur in a variety of conditions and may be chronic or intermittent in nature. Rate-related LBBB exhibits a wide spectrum of clinical association; however its significance is yet to be made with certainty. LBBB is oft en a marker of one of the four underlying conditions associated with increased cardiovascular morbidity and mortality – coronary artery disease (CAD), hypertensive heart disease, aortic valve disease, and cardiomyopathy. Rate-dependent LBBB likewise, may be a manifestation of CAD or myocardial dysfunction, but it can even occur with normal coronaries (2). There are only few cases reported in the literature with coronary vasospasm as a leading cause of intermittent LBBB (3). We report a case of intermittent LBBB who posed diagnostic dilemma and difficulties in decision making. We present the case of a 49 year old hypertensive man, presented to the hospital with 10 days history of intermittent chest pain. He described the pain as severe retrosternal, non-exertional, non-radiating, lasting for 20-30 min and associated with severe diaphoresis and shortness of breath. It used to occur 3-5 times a day and relieved at rest. There was no history of fever, orthopnoea, syncope or peripheral edema. Past history of similar chest discomfort was absent. The patient had 15 pack year’s history of smoking, occasional alcohol intake and no illicit drug use. On physical examination, he looked pale and anxious during the attack but was hemodynamically stable, blood pressure of 130/90 mmHg, pulse of 70 bpm, with normal saturation on room air. Cardiac exam showed normal heart sounds with regular rate and rhythm, there was no jugular venous distention, pulses were strong and equal in all limbs, there was no edema in the lower extremities and lungs were clear. He was subjected to standard baseline investigations and was shift ed to Intensive Cardiac Care Unit for continuous cardiac monitoring. His 12 lead electrocardiogram revealed complete LBBB with a HR of 96 bpm during the episode of chest pain (Figure 1). Except for a mild liver stasis (ALAT 97 mg/dl, ASAT 197 mg/dl), his blood tests, including laboratory evaluation of Troponine-I, complete blood count and biochemical profile were normal. In order to elucidate the cause of liver stasis we performed an abdominal ultrasound which revealed a fatty liver, without other liver or gallbladder disease, and the blood tests for hepatitis C and B were normal. His chest X-ray was normal and echocardiography showed a mildly dilated left ventricle with normal wall thickness and function. No significant valvular abnormalities were detected. Troponine-I was repeated at 6 hours and 12 hours but all turned out to be negative. Because of ongoing angina and new left bundle branch block, he was sent for a coronary angiography which revealed non-obstructive coronary artery disease, only a 40% cardiac muscle bridge in the second segment of the anterior descending artery (Figure 2). During the hospitalization, the LBBB reverted to normal sinus rhythm with antero-lateral T wave abnormalities, as the pain subsided and heart rate touched the normal range (Figure 3). Figure 1. Electrocardiogram during the episode of chest pain revealing complete LBBB with a HR of 96 bpm. Figure 2. Coronarography with a 40% cardiac muscle bridge in the second segment of the anterior descending artery. Figure 3. Electrocardiogram out of the episode of chest pain revealing normal sinus rhythm with antero-lateral T wave abnormalities. This electrocardiographic aspect was suggestive of a severe intraventricular conduction disturbance, mimicking a preexcitation syndrome. That is why we conducted an electrophysiological study which revealed an intermittent left bundle branch block with normal infrahisian conduction, without supraventricular or ventricular arrhythmias or anterograde or retrograde accessory pathways. His chest pains may have been caused by the intermittent, rate-related LBBB, as control of his heart rate and blood pressure with metoprolol and ramipril improved the symptoms on follow-up. The ECG abnormalities were in retrospect likely due to cardiac memory, but in order to elucidate the cause of the intraventricular conduction disturbance, we recommended a cardiac magnetic resonance imaging. Th is is a complex case of intermittent LBBB in a patient presenting with suspicion of acute coronary syndrome, who posed a diagnostic dilemma. Recognition of this rate-dependent LBBB is of paramount importance because it needs to be distinguished from a patient with new-onset LBBB with ischemic chest pain, which forms an indication for acute revascularization therapy (4,5). Intermittent, rate-dependent LBBB occurs due to prolongation of the refractory period of the main left bundle branch or both, the anterior and posterior fascicles together. Once the heart rate slows and the RR interval is longer than the refractory period of the conduction pathway, normal conduction can occur. It was once felt that this prolongation of the refractory rate is usually due to intrinsic disease of the cardiac conduction pathway. However, other causes, such as myocardial dysfunction secondary to myocarditis, cardiomyopathy, left ventricular hypertrophy, valvular disease and ischemic causes need to be considered (5). The critical heart rate at which normal sinus rhythm converts to LBBB is often higher than the rate at which it disappears. Surawicz et al. (6) revealed that patients with intermittent LBBB may have transient T-wave inversion when ECG reverts to normal sinus rhythm because of repolarization abnormality. This abnormal T wave may be pronounced and consideration must be made that it could reflect critical LAD occlusion. 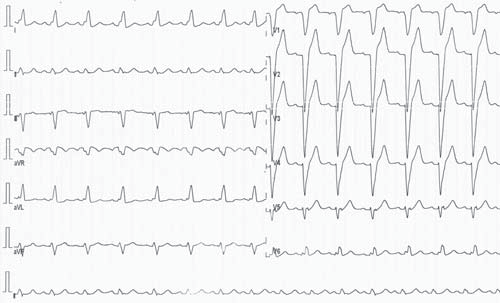 These T-wave changes are similar to those after termination of chronic right ventricular pacing (left bundle-branch pattern), suggesting that both patterns of abnormal ventricular activation can produce abnormal repolarization when activation returns to normal. 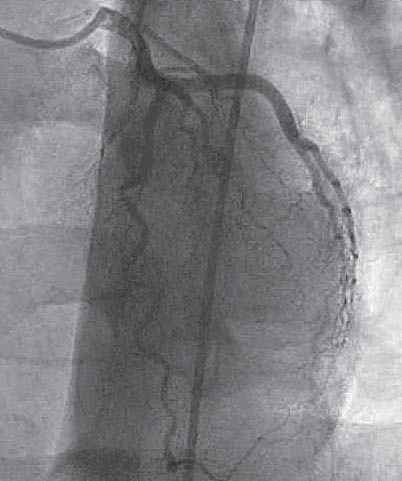 Before the advent of coronary angiography, ratedependent BBB was considered to result from coronary artery disease (7), especially anteroseptal ischemia. Vieweg et al. (8) reported intermittent LBBB in patients with normal coronary arteries. Similarly, Virtanen et al. (9) also found rate-dependent LBBB in patients with chest pain having normal coronary arteriogram. Myocardialperfusion imaging revealed reversible perfusion defects in the absence of stenotic CAD in patients with LBBB and angina pectoris (10). Our paper demonstrates the importance of a complete examination of all causes of intermittent rate-dependent LBBB. Unlike the aforementioned cases of intermittent LBBB in patients with normal coronary arteries, even if our patient had non-obstructive coronary artery disease, we decided to conduct an electrophysiological study in order to elucidate the electrocardiographic aspect suggestive of a preexcitation syndrome. Even in the absence of anterograde or retrograde accessory pathways and the fact that the ECG abnormalities may be due to cardiac memory, we recommended a cardiac magnetic resonance imaging in order to better elucidate the cause of the intraventricular conduction disturbance. 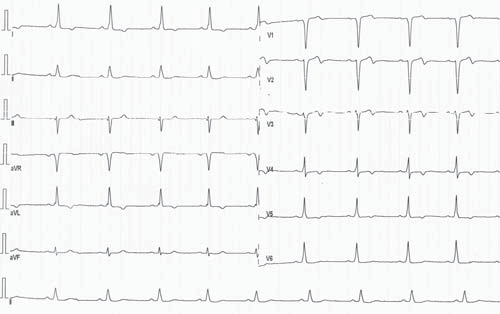 Recognition of this electrocardiographic entity is of importance since it could mislead the emergency physician and may lead to errors in decision making while dealing with a case of chest pain with new-onset or intermittent LBBB. Serial ECGs may help to distinguish the two abnormalities here (11). However, one randomized controlled study of patients with intermittent LBBB suggests that there exists a relationship between intermittent LBBB and acute coronary syndrome, and that it may be an independent prognostic marker for CAD. Exercise-induced LBBB has also been shown to be a strong predictor for major cardiac events (12). It is postulated that patients who present with typical anginal chest pain and rate-dependent LBBB at a heart rate of <125/min is usually indicative of ischemic heart disease, whereas those who develop LBBB at heart rate of >125/min are generally cases of non CAD (13). In our case, the patient presented left bundle branch block at a heart rate of 96/min and the coronary angiography revealed non-obstructive coronary artery disease, only a 40% cardiac muscle bridge in the second segment of the anterior descending artery. Though the lone presence of intermittent LBBB may not always be considered to reflect acute ischemia, our case report here highlights that it is imperative for the attending physician to keep a high index of suspicion for coronary artery disease even with negative cardiac biomarkers. The particularity of our case represent the diagnostic of an intermittent left bundle branch block in a patient without obstructive coronary artery disease, with an electrocardiographic aspect in normal sinus rhythm suggestive of a preexcitation syndrome, unconfirmed in the electrophysiological study. This case represents a diagnostic and therapeutic challenge for interdisciplinary practitioner physicians and a cardiac magnetic resonance imaging may be the perfect strategy to elucidate the cause of the intraventricular conduction disturbance. Although the patient chest pains may have been caused by the intermittent, rate-related LBBB, as control of his heart rate and blood pressure improved the symptoms on follow-up, an important issue remains the possibility to elucidate the cause of the intraventricular conduction disturbance using a cardiac magnetic resonance imaging. Conflict of interest: We declare that there is no conflict of interest. 1. Neeland IJ, Kontos MC, de Lemos JA. Evolving considerations in the management of patients with left bundle branch block and suspected myocardial infarction. J Am Coll Cardiol 2012;60(2):96-105. 2. Liu L, Okamura T, Kadowaki T, Murakami Y, Hozawa A, Kita Y, Takashima N, Okuda N, Okayama A, Ueshima H. Bundle branch blockand other cardiovascular disease risk factors: US-Japan comparison. Int J Cardiol 2010;143(3): 432-440. 3. Alhaji M. Intermittent left bundle branch block caused by coronary vasospasm. Avicenna J Med 2013;3 (2): 50-52. 4. Steg G, James SK, Atar D et al. ESC Guidelines for the management of acute myocardial infarction in patients presenting with ST-segment elevation: the Task Force on the management of ST-segment elevation acute myocardial infarction of the European Society of Cardiology (ESC). Eur Heart J 2012;33: 2569–619. 5. Nikoo MH, Aslani A, Jorat MV. LBBB: State-of-the-art criteria. Int Cardiovasc Res J 2013;7(2): 39-40. 6. Surawicz B. Transient T wave abnormalities in intermittent bundle branch block. Th e American Journal of Cardiology 1982;50: 363-64. 7. Vasey C, O’ Donnel J, Morris S et al. Exercise induced left bundle branch block and its relation to coronary artery disease. Am J Cardiol 1985;56: 892-895. 8. Vieweg W, Stanton K, Alpert J, Hagan A. Rate dependent left bundle branch block with angina pectoris and normal coronary arteriograms. Chest 1976;69: 123-124. 9. Virtanen K, Heikkila J, Kala R et al. Chest pain and rate dependent left bundle branch block in patients with normal coronary arteriograms. Chest 1982;81(3): 326-331. 10. Kumar V, Venkataraman R, Aljaroudi W et al. Implications of left bundle branch block in patient treatment. Am J Cardiol 2013;111: 291-300. 11. Mansoor M, Mugmon M. Intermittent left bundle branch block. J Community Hosp Intern Med Perspect 2012; 2(3): 10.3402/jchimp. v2i3.19037. 12. Grady T, Chiu A, Snader C et al. Prognostic signifi cance of exerciseinduced left bundle branch block. JAMA 1998; 279:153-157. 13. Hertzeanu H, Aron L, Shiner RJ et al. Exercise dependent complete left bundle branch block. Eur Heart J 1992; 13(11):1447-1451.